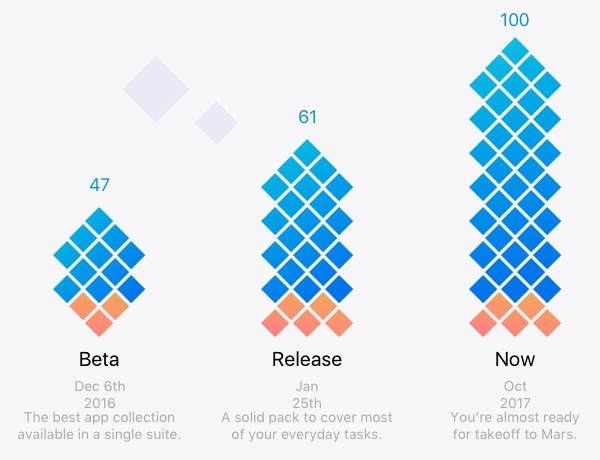 When we launched Setapp in beta, we had 47 apps in our collection. 47 developers who believed in the idea that was very much up in the air at the moment. To change the way people use Mac apps, subvert the software market, rearrange distribution model — a far-fetched dream that they agreed to share with us. Today, we have 100 apps and more are coming within weeks. Setapp collection covers more everyday tasks than any Mac service in existence. The market is changing, and we are the change we wanted to see, just like it says on that T-shirt you brought from a leadership summer camp. You can see what has changed and how we got here in this infographics we’ve humbly prepared for the date. And for now, let us tell you about the journey we had. 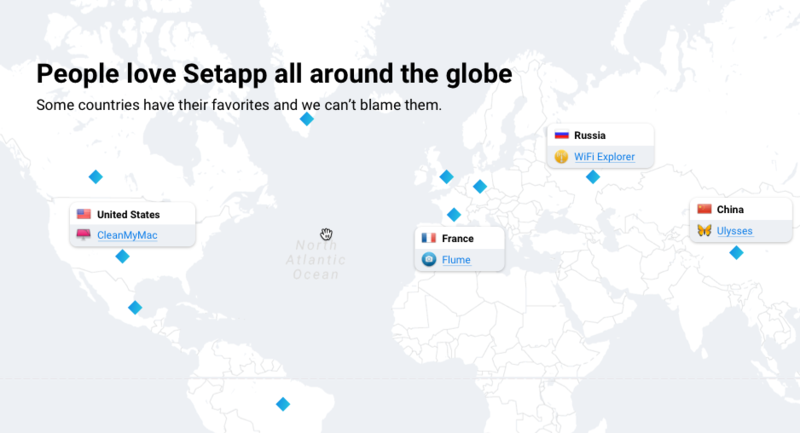 Right now, Setapp is nothing like it used to be when we launched. If you were among the first beta users, you’ve seen the transformation, and if you weren’t, lucky you to only catch its final form. Setapp used to look like a folder in Finder, filled with apps. The apps were great but finding the one you need was no picnic. That’s why now Setapp has a beautifully designed personalized dashboard with easy tag-based search and rich previews. We listened carefully to every suggestion and introduced a lot of goodies in these past few months. For instance, we now have four localizations in Spanish, French, German, and Brazilian Portuguese. People all over the globe are having a better time using the apps and figuring out what they’re for. 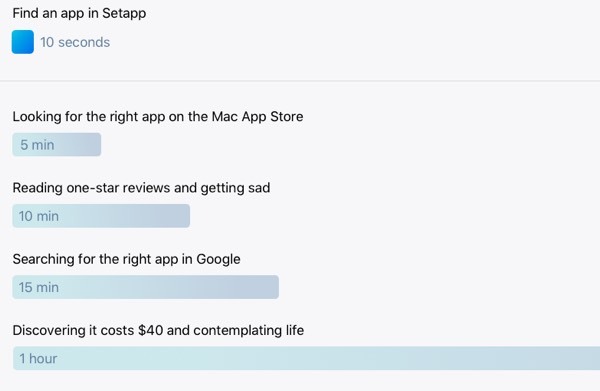 We also asked people which apps they needed, or rather, what else they’d like to do on their Macs with Setapp. 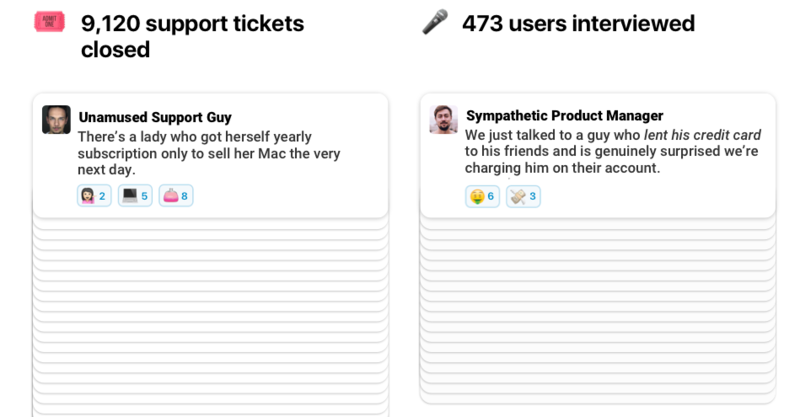 They gave us a full stack of insights, so we hand-picked the best apps for the job, contacted their creators, and showed them how great it would be if they joined. And join they did. Now we have so many amazing apps our users are starting to forget how the Mac App Store looks like. But the best feature we’ve developed was a smart recommendation system. It’s an algorithm that uses machine learning (because what doesn’t, it’s 2017 after all) to predict which apps you’re going to like. It looks at the apps you’ve installed and then offers you apps that other people installed together with this one, or apps that are thematically connected, or apps that go well together. Anyway, you’re going to enjoy our recommendations, especially considering the fact that the more you use Setapp, the better they get. Our recommendation system learns from your actions and preferences, offering you the best next app. We’re incredibly grateful for all the feedback from our amazing community, and our lively Facebook group in particular, because they helped us figure out what Setapp needs to become. Thank you, guys. It’s been an amazing journey and an even better one lies ahead. Development continues, apps keep adding, and the Mac software market keeps changing with us. Thanks for being with Setapp.